Here is how the Team Mood Tracker can support you to be closer to your remote team. It will make your team's mood visible and can serve as a discussion basis to increase trust within the team. The Team Mood Tracker is a product that will support you achieving exactly that: by implementing and using it you show appreciation for every single team member. You show that you value your team and you are able to build up trust and transparency immediately. 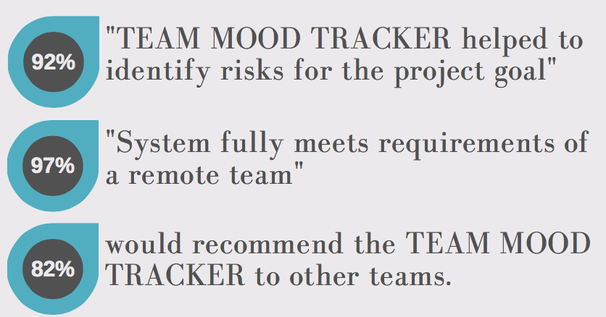 The Team Mood Tracker works as an early warning system for typical project risks such as misunderstandings, late communication, no communication about everyone’s mood. Using the Mood Matrix within a project context prevents the team leader from getting only “green lights” from the team to pretend everything is fine. By using the Team Mood Tracker you know the emotional level of your remote team easier and earlier than ever before without calling every single team member. It is based on scientifically research and studies with 10 remote teams during several months of work and a total of over 70 users. Send me a note why you and your team would like to be my beta team for the english version of the TEAM MOOD TRACKER...I'm happy to answer your questions. So reach out at any time. Click the blue button to follow me on Twitter. I'm connected to some remote team gurus and will retweet interesting news of the virtual team scene.